If you believe your lashes are short or sparse, you may be a good candidate for Latisse Seattle. Many people ( contact lens wearers in particular) don’t want to apply mascara every day, but they would like to have prominent eyelashes. Clinical studies of Latisse showed that roughly 80% of users achieved a significant change in their eyelashes. Eyelashes become significantly longer, darker and fuller when using Latisse. Where can I Purchase Latisse in Seattle? Latisse can be obtained from a physician (usually a cosmetic surgeon or dermatologist) after a standard examination. Dr. Jonov may review your medical history and other information to determine if Latisse is suitable for you. During your visit to Seattle Plastic Surgery Center, you will learn how to use Latisse at home. Application is a simple daily process, during which you apply the solution directly along the base of your upper eyelashes once a day with a small, easy-to-use applicator. A tissue is used to gently dab any excess from around the eye area. Doctors do not recommend using Latisse on the lower lashes or eyebrows. If you wear contact lenses, you will be advised to remove them before applying Latisse. You can reinsert contacts again 15 minutes after application. Most patients see results appear some time between 8 and 12 weeks after starting daily application of Latisse. In 16 weeks, you should see the full effects become evident. Latisse is not a permanent solution for short, sparse eyelashes. It works while you use it, but your lashes will regress to their natural state if you stop using it. Approximately 4% of Latisse users report itching and/or eye redness, which are temporary. Less common are side effects that may occur on the skin near your eyes, such as skin darkening or irritation. Keeping Latisse solution on the base of the upper lashes and taking care not to get it on other parts of the eye can reduce the risk of side effects such as irritation. 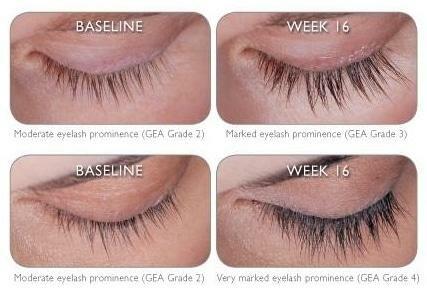 Still, it’s important to be assessed by a doctor to make sure you are a good candidate for this lash-growing solution. All prescription medications have potential side effects, and we will discuss them with you during your office visit to Seattle Plastic Surgery Center. Do you have questions about Latisse? Contact the office of board-certified Seattle cosmetic surgeon Dr. Craig Jonov for more information.